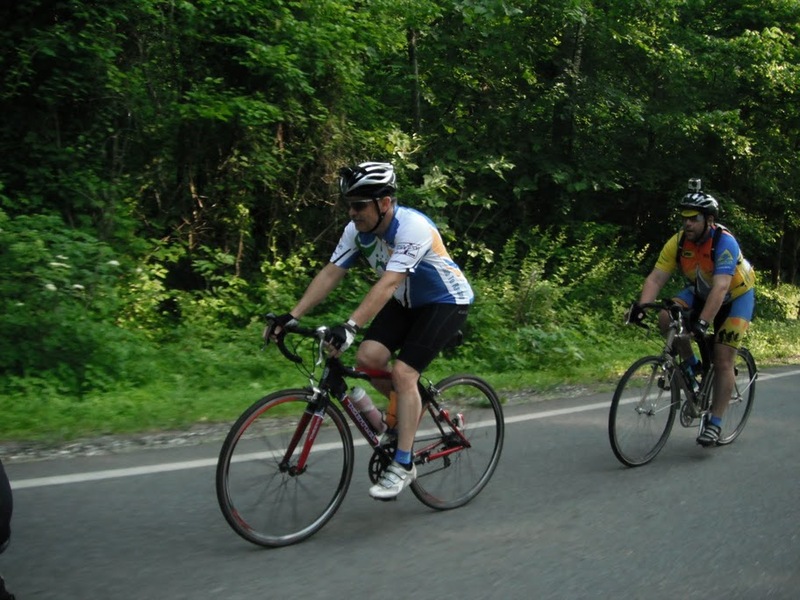 I look forward to the Severna Park Peloton Summer Holiday Rides. Last year was the first year I rode the Memorial Day Ride. This was much easier than that ride was. 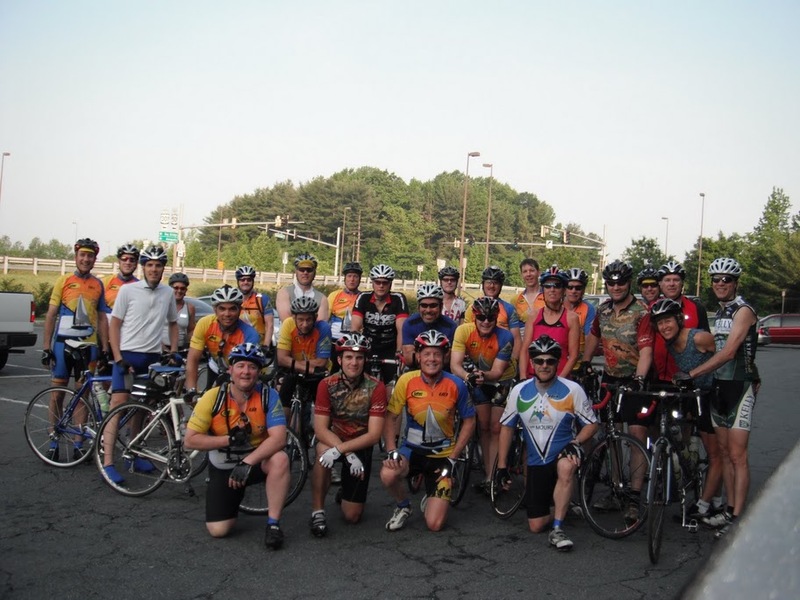 Knowing what kind of miles I was riding this week, I opted for the shorter version of the Memorial Day Ride, starting at the Davidsonville Park & Ride rather than starting with 19 others in Millersville (which made their route about 90-100 miles). That was a good choice, and I’m glad I made that decision. 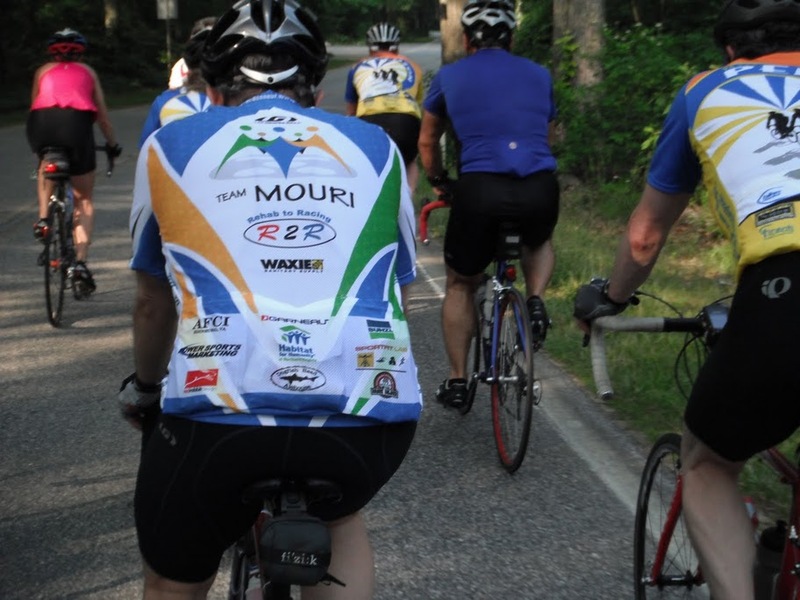 I wore my Team Mouri (RAAM) jersey, and it was quite a hit. I talked about the upcoming RAAM event quite a bit. When the 19 arrived, we posed for photos, had our ride briefing, then took off on a quick pace down to North Beach & Sweet Sue’s Bake Shop. I had forgotten my Garmin, so I turned on the imapmyride application on my iPhone. The track down to Sweet Sue’s worked, but it stopped working on the way back, so I’m not posting the map. I stayed with the faster group all the way down, only having to bridge one gap to stay with them, and averaged 19+ mph on that leg of the trip. It was pretty uneventful. We had 25 riders and it is always good to ride in a group that size. We had some people who struggled because this was a very long ride for them and/or they were really out of shape for this ride, but we always had some riders with them. Sweet Sue’s was ready for us when we arrived. Clint calls ahead with our numbers. We poured into the place like we owned it, completely overwhelming the patrons sitting down for breakfast. As it turned out, another cycling group arrived from Annapolis shortly after our first group got there, so there was a steady line of cyclists for a good 45 minutes. I had a strawberry smoothie and a pina colada muffin that really hit the spot. I even went in before we started back and ordered another strawberry smoothie to go, put it and some ice in my insulated water bottle, and enjoyed it for the next 10 miles. We were not very disciplined coming back. The temperatures climbed into the lower 90’s with relatively high humidity. The heat index was over 100 and a heat advisory was issued. The 25 riders broke up into many smaller groups. I was riding comfortably with one group, but knew that some riders were a ways back, struggling, and so I turned around and rode back with Clint to support those riders on the way back. The people I was looking for specifically were not there, but I hung with this group to the end. We all drained our fluids pretty quickly, and had to ride about 4-5 miles with no fluids until we made it to Harwood and the one gas station on the return route. There we filled up with water, Gatorade, and ice, and prepared for the final few miles (for me) to the Park and Ride. 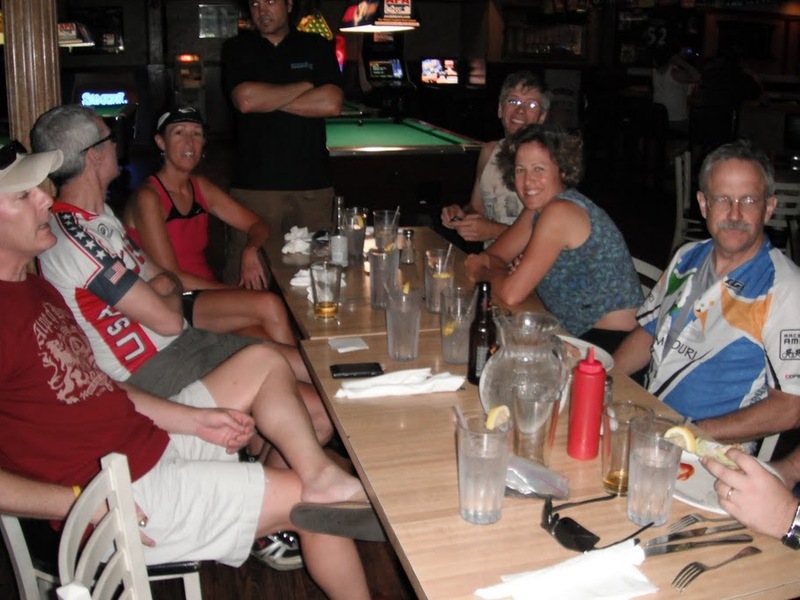 Others continued on to Millersville to the planned rendezvous at a local pub for some food and beer. On my way back, I looked for a rider that had insisted going off on his own back to Annapolis. I couldn’t find him, and later discovered that he had stopped into a Whole Foods (where his wife worked) about the time and place where I anticipated him. He later reported that he had gotten home. We finally settled upon Hellas (the only place we could find open on this holiday) where I had a burger and a beer. That and the air conditioning and the company really hit the spot. Since I don’t have a Garmin track, you will have to settle for a few photos, complements of Bryan. Not much to say about an easy recovery ride this morning. There were 5 of us out. Dave and Ben wanted to go fast. Clif, Dan, and I were content to go slower. Dan will be outside working in the heat all day and there was no need to push it on this very warm and humid morning. I’m moving into my preparation mode for a 100+ mile ride on Thursday, so an easy spin for the legs was the order of the day. No creatures were killed in the making of this ride, except maybe the bug that smacked me in the face at 30 mph. Base miles and blood moving through the body is a good thing. And the miles are in for May. I missed my 800 mile goal by 65 miles, but I had that in the bank. I’ll miss June’s goal of 900 by much more because of RAAM. I’ll have to revisit the monthly goals to see if 8000 miles for the year will be possible.